CHICAGO – Novian Health, developer of Novilase® Breast Therapy, announced today that it has been selected as a finalist for Red Herring’s Top 100 North America award, a prestigious list honoring the year’s most promising private technology ventures from the North American business region. “It is an honor to be recognized by Red Herring,” said Henry “Chip” Appelbaum, Novian Health’s President and CEO.“With our laser technology, we hope to improve the treatment of early‐stage breast cancer for women and make it more effective and less traumatic than surgery. The Red Herring Top 100 award highlights the most exciting startups from Asia, Europe and the Americas. Hundreds of companies from each region are reviewed in a rigorous three-­step process that examines the companies’ technological innovation, management strength, market size, investor record, customer acquisition and financial health. Applicants for the award included companies from the fields of security, Web 2.0, software, hardware, life sciences, cloud, and mobile, among others. Red Herring is a global media company that unites the world’s best high technology innovators, venture investors and business decision makers in a variety of forums: a leading innovation magazine, an online daily technology news service, technology newsletters and major events for technology leaders around the globe. Novilase Breast Therapy is a laser-based,minimally invasive device for destroying tumors. It provides an alternative to conventional surgery while preserving the patient’s options for additional procedures or adjunctive therapies. The image-guided outpatient procedure does not require general anesthetic or a hospital stay. 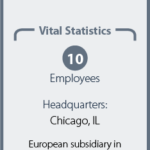 Novian Health Inc., based in Chicago with a subsidiary in Evry, France, is a privately held medical device company with proprietary technology for the treatment of tumors using Interstitial Laser Therapy. Developed as an alternative to surgery,the company’s technology uses parametrically controlled heating for the ablation of tumors. Image-guided treatment of breast tumors is the first application of the technology, with the potential for Novilase to treat tumors elsewhere in the body. Novian Health has received U.S. FDA 510(k) clearance for the treatment of benign breast tumors. For more information, call (312) 266-7200 or access www.novianhealth.com.